One of the joys of writing a column like Riverwatch is that I’ve met so many lovely people who have special memories of the Thames over the years. One such is Patricia Eustace, a sprightly 86-year-old, whose charming cottage fronts on to the towpath close to Shepperton Lock and who I wrote about last year when she recalled learning to swim in the Thames by Pharoah’s Island. Well, the ‘Lady of the Lock’ as I christened her, has been in touch with me again having discovered this wonderful picture of her husband, Edgar, as a youngster with his cousin, Ken, messing about in the water right by what used to be Dunton’s Boatyard. She believes the photo was taken around 1927 or ’28. Pat had known Edgar since they were both children and remembers playing with him and other youngsters around the lock. “It was long before they had mechanical means of opening the gates,” she says. “Instead, there were huge timbers attached to the gates and they had to push against them to open the lock gates whenever a boat wanted to enter. Pat and Edgar married after the war when Edgar returned from serving with the RAF in India. He supervised the building of aircraft out there and, following their nuptials, he got himself a job working for Vickers at Brooklands. Sadly, Edgar died a number of years ago but Pat still has many happy memories of their time together. Looking at the photo, does anyone remember much about Dunton’s? From the sign outside the shed it says they were boat builders but I wonder if anyone can tell me what kind of craft they built there? And do any other readers have pictures of days gone by on the Thames they’d like to share? If so, contact me at the email address or phone number at the end of this column. AS always, I’m very grateful to Peter Bailey of the Sunbury and Shepperton Historical Society who, apart from being an absolute mine of information about the river, also let me take a look at the Society’s archive of reference books. 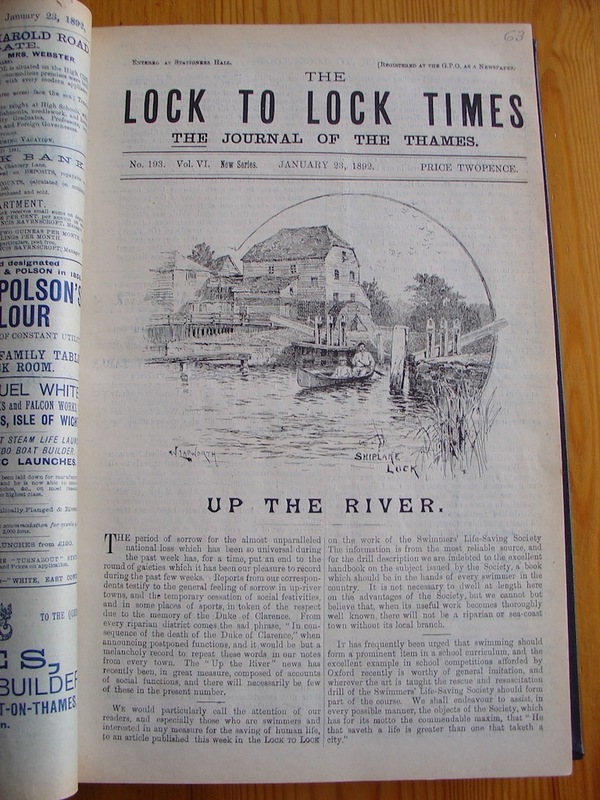 A couple of volumes that particularly caught my eye were bound editions of a publication called The Lock to Lock Times, a newsletter concerning events along the length of the Thames. Peter kindly allowed me to hunt through the pages of one tome – dated Jan-June 1892 and the contents make absolutely fascinating reading. The Lock to Lock Times consisted of a series of snippets detailing life along the river. I picked this little gem from the edition dated February 13 to demonstrate that blogging may be a word associated with the internet but the practice goes back a good deal farther.